On site, the visitors could see the remains of structures built there by the Iron Age and Roman period people: ditches and post holes from round houses, field systems, storage pits, etc. 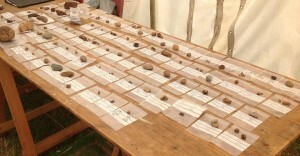 A special display allowed public to see for the first time the finds coming from the excavations at Ipplepen. Although the site has been previously presented to the public mostly in connection with Roman coins discovered over a number of years by metal detectorists Phillip Wills and Dennis Hewings, this year we focused on those finds which give a broader insight into the daily life of the settlement. These include a range of pottery fragments including a few from the earlier prehistory (Neolithic, Bronze Age), and mainly from the Iron Age and Roman period when the settlement was in use: fine decorated tableware, Roman oil or wine amphorae, and storage or cooking vessels. In addition to these, flint flakes and iron slag indicate the production of flint and iron tools on site while, sling shots and animal bones. Some of the finds from the site. A display on site by the Devon County Council Historic Environment Office helped visitors to place the discoveries at Ipplepen in the broader historical and archaeological context of the region. The information point in the Ipplepen Community Hub offered a picture gallery of the evolution of work on site over the current season, a range of activities involving archaeological artefacts for children and adults and background information about the site, archaeology programmes in University of Exeter, the historic environment in Devon and the Portable Antiquities Scheme in Devon and nationally. The public which participated in the survey came mostly from the Southwest Britain, though through the crowds could be spotted some foreigners probably holidaying in the area from Japan and France. Many of the individuals who responded to our survey came out of an interest in local history and archaeology and found out about the event from a broad range of sources (local media, national radio news, local advertising campaign by the project through leaflets and information point/blog/facebook). Many felt that the best part of the day was being able to see an archaeological excavation and the work in progress. Various visitors were surprised to realise the importance of the site, impressed with our displays and were impressed with the level of knowledge of the students doing presentations on site. They found the level of community involvement provided by our project to be good and excellent, learned that there is still a lot more to discover as the project is still in its early days and gained new insights into the link between history and archaeology, about the contribution of Roman coins to archaeology, about cross dating techniques, or about pottery in the Iron Age. Many felt inspired to find out more about the project and about archaeology and to join the project as volunteers in the future for fieldwork or local history research. For more information please visit the Ipplepen Blog. This entry was posted in events, research on 22nd Aug, 2013 by Jenna Richards.